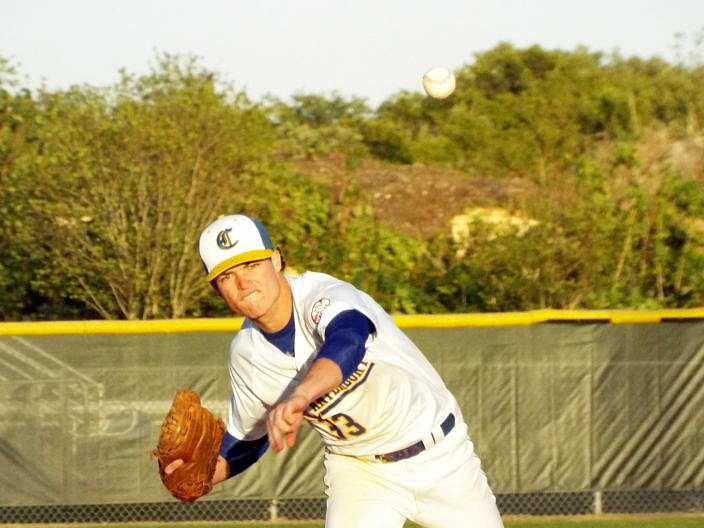 It was quite an offense showcase on display Friday night in St. Petersburg when the Keswick Christian Crusaders traveled to face their crosstown and 2A-5 rivals, the Canterbury Crusaders. The wild, back-and-forth game lasted more than three hours and saw four lead changes and 26 hits combined, but despite falling behind by four runs twice, Canterbury rallied behind the bats of Hunter Chance and Brendon Smith. The duo combined to drive in six, including the deciding run in the fourth on an RBI double from Smith that scored Daniel Redmond from second. Bobby Ballew closed the door on Keswick’s rally, allowing just one run in the final four innings and Canterbury evened the season series with a 14-11 victory over Keswick, stretching their winning-streak to six games. When the two teams met earlier in the season, Canterbury (12-4, 9-2) was held to no runs on just four hits in the loss. It was clear very early on that there was not going to be a repeat performance from the Canterbury offense this time around. Canterbury fell behind quickly in the top of the first, surrendering four runs to Keswick (10-4-2, 9-2-1) who came in hot, riding a four-game winning streak, having scored 34 runs in that span. Canterbury quickly tied the game in the bottom of the first, setting the tone for the rest of the game. Short Stop Caleb Rogers led Keswick in hits, going 3-for-4 on the night with a RBI and two runs scored. The top four of the Canterbury lineup dominated from start-to-finish. Bobby Ballew, Jacob Wilson, Dalton Shettle and Redmond combined to score 11 runs and tally seven of the team’s 16 hits on the night. Despite the offensive output, Canterbury once again faced a four-run deficit in the third, this time after holding a lead for the first time. Canterbury had to keep focused because Keswick would not let up. After falling behind 6-5, Keswick retook the lead on a bases-clearing triple from Cameron Horner, who scored on a wild throw to third, giving Keswick the 9-6 lead in the third. Will McClure scored one of his three runs later in the inning to stretch the lead to 10-6, all with two-outs in the inning. Freshman Austin Berringer drove in three runs to match Horner and help Keswick reach double-digit runs for the fifth time this season. Keswick put up the impressive numbers despite missing several key seniors on the night, but it was just not enough. Antonio Ramos prepares for a ball hit to second in Friday’s 14-11 win over Keswick. After closing to within one with a three-run bottom of the third, Canterbury took charge in the fourth inning. Bobby Ballew came around to score the tying run on a sac-fly from Jacob Wilson. Back-to-back doubles from Redmond and Smith gave Canterbury the lead for good later in the inning. Ballew also took charge on the mound. 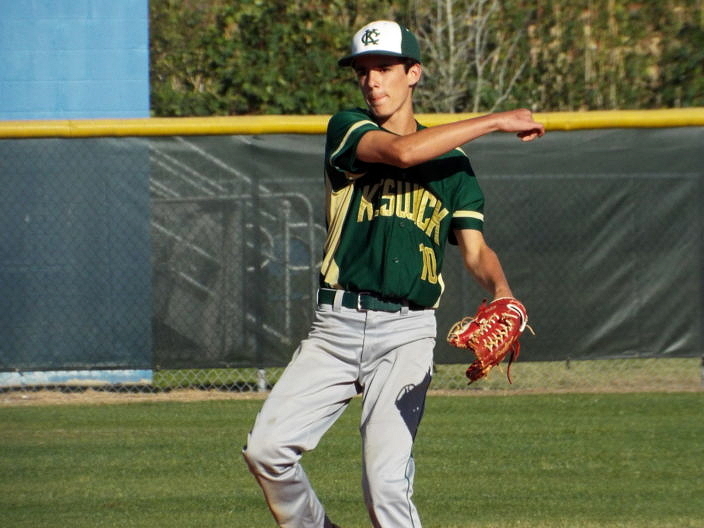 After coming in for relief in the third inning, and surrendering a few runs early, Ballew settled in to hold Keswick to one run over the final four innings. The biggest threat late came in the sixth inning when Keswick scored a run, but it could have been much more. 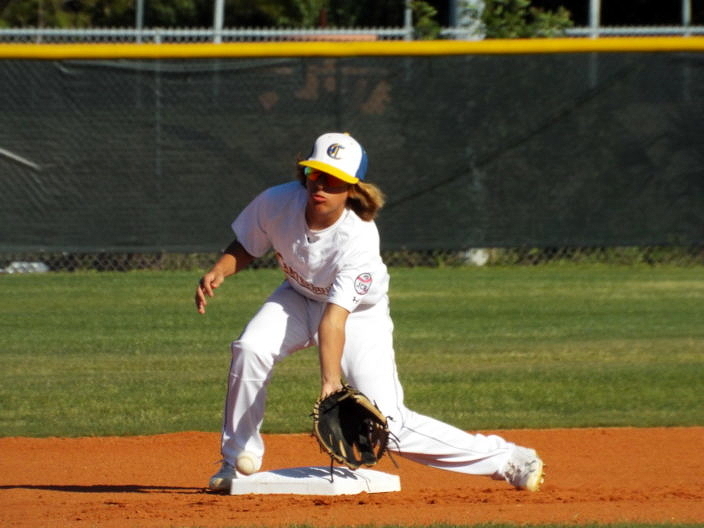 Two great fielding plays by catcher Hunter Chance, including a play at the plate, prevented more runs. Ballew did the rest, striking out nine batters and picking up the big district game.